Pull the ultra-slim, ultra-stylish COOLPIX S7000 out of a pocket or purse, zoom in with much more power than you'd expect from such a small camera—20x—and capture beautiful close-ups of distant action. Then use the built-in Wi-Fi® and Near Field Communication technology (NFC)** to connect to your camera to a compatible smartphone so you can start transferring photos from the COOLPIX S7000 to your smartphone wirelessly! With Vibration Reduction (VR) keeping your 16-megapixel photos sharp and your Full HD 1080/60i videos steady, Scene Modes for overcoming tricky shooting situations and plenty of creative Image Effects, your photos and videos will be the envy of your friends. Every COOLPIX is designed around a genuine NIKKOR glass lens, the legendary optics that have helped make Nikon famous. The COOLPIX S7000’s 20x optical zoom lens goes from wide-angle—great for portraits and landscapes—all the way up to telephoto—great for closeups of sports, concerts, nature and more. When you need even more reach, zoom up to 20x with optical zoom and 40x with Dynamic Fine Zoom, an enhanced digital zoom function that effectively doubles your reach. Quickly and easily send photos wirelessly from your Wi-Fi & NFC enabled COOLPIX S7000 to a compatible smartphone or tablet±. Share your great photos on the go, even in remote locations, or use a smartphone or tablet to control your camera. 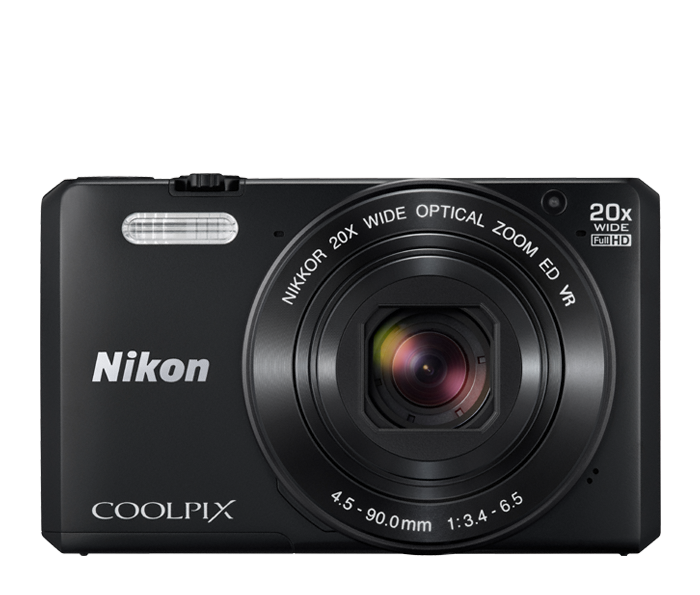 With the press of a button, the COOLPIX S7000 becomes a high-performance video camera. 4-axis Hybrid Vibration Reduction (VR) helps you shoot stable, smooth videos without a tripod, and a built-in stereo mic captures high-fidelity sound. Apply creative effects, combine short video clips into a 30-second montage, even create amazing time-lapse movies right in the camera. Experienced photographers optimize their camera settings to match the situation. The COOLPIX S7000 does that work for you. With 18 Scene Modes, including Beach, Snow, Night Portrait, Sunset and more, it's easy to match the moment to a Scene Mode. You can even get creative and use Scene Modes to alter ordinary shots. Or, select Easy Auto Mode and let the camera choose the best mode for your situation. It's frustrating when a smartphone camera focuses on the wrong thing. With COOLPIX S7000, Target Finding AF instantly and accurately determines your intended subject and focuses on it—not on just whatever is closest to the camera. Catch the shot you want on the first try. No more out of focus shots or the frustration of trying to get the camera to focus on the right thing. Kids and pets are always on the go. Fortunately, the COOLPIX S7000 includes Subject Tracking, which automatically locks onto a moving subject and helps keep it in focus until you're ready to take the shot. Lens-shift VR Vibration Reduction keeps the shot steadier, even if your hands are not. Say goodbye to blurry photos, shaky videos and tripods.